I’ve gotten a bit fed up (get it?) of seeing vegetarian sites claim humans should be vegetarian based on physiology, and then compare human form and function to herbivore and carnivore, but ignore omnivores completely, or cherry-pick a few facts to make it look as if humans closely resemble a vegetarian’s form. So here are pictures, straight from the horse’s mouth (as it were), where it’s harder to hide evidence. I don’t know about you, but the dentition on that chimp looks pretty close to a lot of humans I’ve seen. And yes, chimps and all primates are, in fact, omnivores (though like humans, some eat more plant food than others). 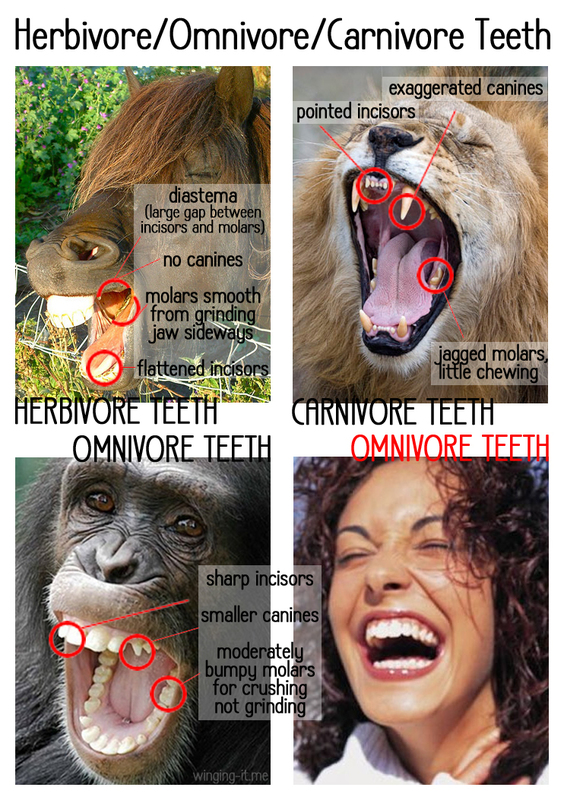 Almost all herbivorous mammals have a large gap, or diastema, between their incisors and molars. Almost universally they are missing the canine teeth entirely (a few stallions have vestigial canines). Many also are missing upper incisors – sheep merely have a rough pad against which their lower incisors cut grass. I’ve known a few human folk who resemble that, but they fall generally into the failed-dental-hygiene group. One claim is that carnivores can only open their jaws up and down, with no lateral motion, while herbivores can move their jaws side to side … and so can humans! Sure you can – when your mouth is open. When chewing, however, humans crush their food, with very minimal lateral motion of the jaw. The bumps in your molars that match up when your jaw is clenched won’t let you chew this way without great stress on your jaw. Let me tell you, if you have ever seen a human being chew food like a cow or horse, with a lateral movement of the jaw, get him to a dentist. Then a chiropractor. In a surprisingly candid piece, the Vegetarian Resource Group posted Humans Are Omnivores, detailing that both historically and physically, humans are clearly omnivores, and basically telling vegetarian proselytizers to focus on other issues and leave the physiology issue alone. If you want to be a vegetarian, be a vegetarian. But don’t kid yourself that your physiology requires it of you. 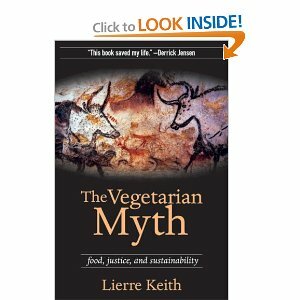 Good reading: The Vegetarian Myth.